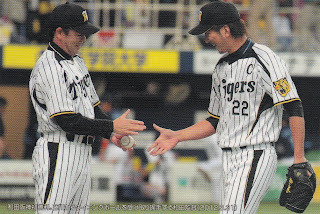 Yuki Saitoh had a bit of a rough start today (giving up 6 runs - only 4 earned - against Orix in 3+ innings) and is getting demoted to ni-gun. 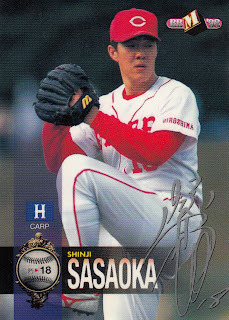 A little over a week ago, Saitoh was the starting pitcher for the PL in the first game of the All Star series - I wonder if anyone was ever sent to the minors that quickly after starting an All Star game. He actually had to submit a written report about his All Star experience to Fighters manager Hideki Kuriyama - a two page report on B5 paper (my daughter couldn't decide what was stranger - that he had to submit the report or that he did it on B5 sized paper). So it's been a tough couple of days for Yu-Chan between the poor pitching, the demotion and the writing assignment. Maybe Kuriyama will make him write "I will not hang a pitch to Norihiro Nakamura" 100 times on the black board as well. 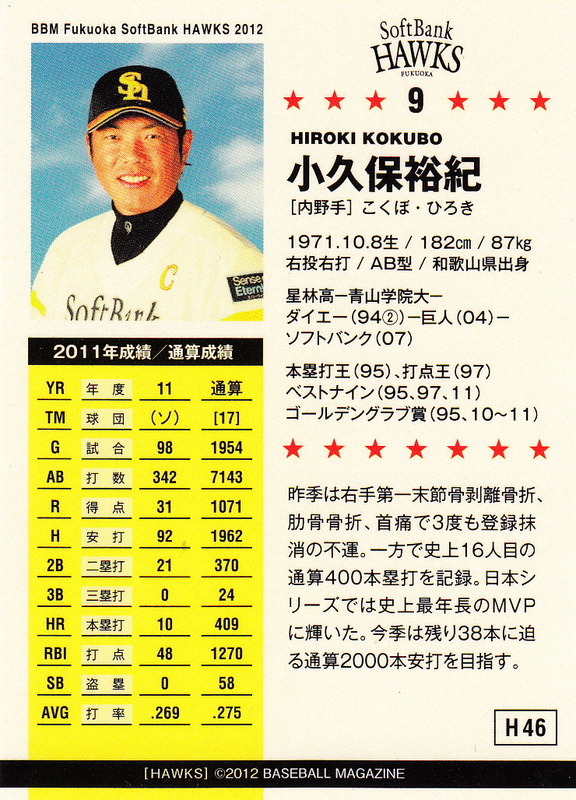 Calbee continued their 40th Anniversary "Memorial Card" subset in Series Two. There are 12 cards in this subset that are reprints of cards from Calbee's past. I'm not positive, but I think the players shown are all coaches with the current 12 teams (and each team is represented with one card). The cards are again numbered in continuation of the subset from Series One. 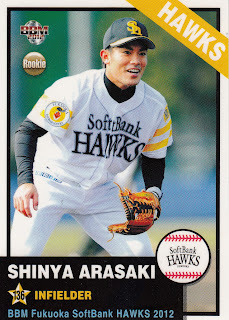 Unlike the Series One "Memorial Cards", I have the originals of a couple of the cards reproduced here, so we can see what Calbee did to adjust the card size to match the size of today's cards. 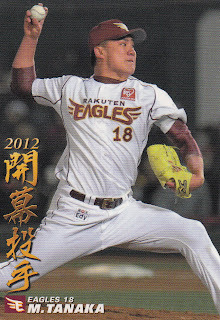 The appearances of the cards here are a little misleading - the 2012 cards are larger than either of the original cards. 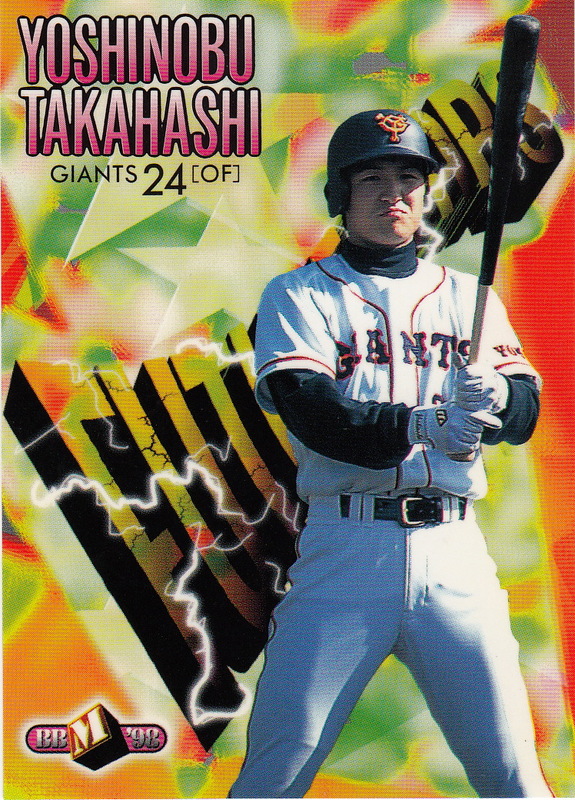 For the Tabuchi card, it looks like they simply expanded the image a little and extended the top border to make it fit. For the Takahashi card, it loks like they cropped it and blew it up a little. 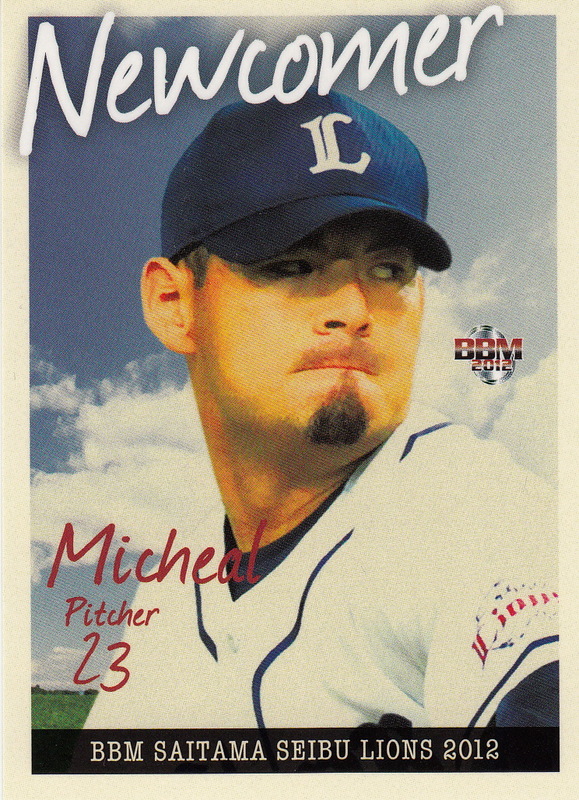 Series Two does feature one subset that is all its own - a 12 card one featuring all of this season's Opening Day starting pitchers. 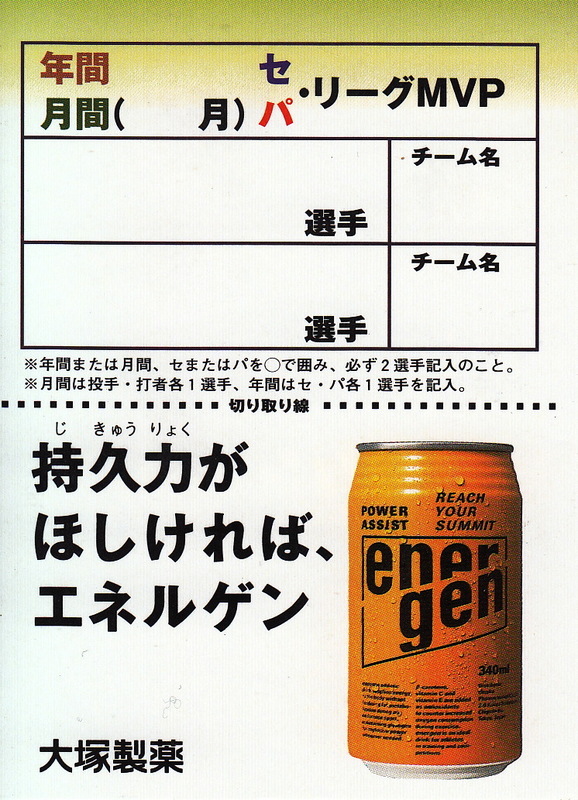 All the cards can be seen here. I don't normally buy BBM's team sets - I feel like I have to draw the line somewhere on what I get. But as I mentioned in a conversation with Jason in the comments of this post, my curiosity was piqued by the Hawks and Lions team sets this year. Instead of the kind of standard BBM card design - mostly borderless photo with a minimum of text, both sets had a retro design that was evocative of some sets from the US. 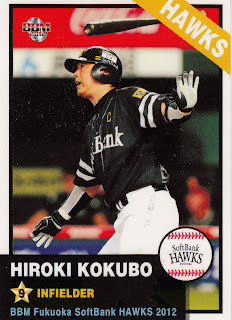 The player cards from the Hawks set are a throwback to a couple of Topps early sets. 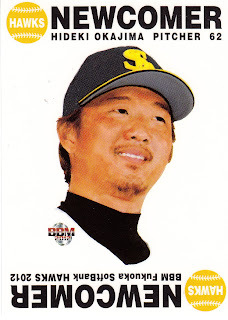 They've got the large rectangle on the lower part of the card that doesn't quite go the entire width of the card from the 1953 Topps set and the "team name on an angle in the upper corner" feature of the 1966 Topps set. 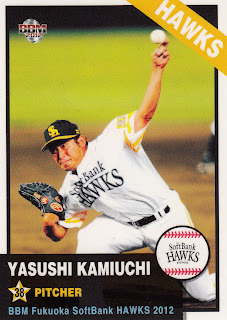 You can see all the Hawks cards here. 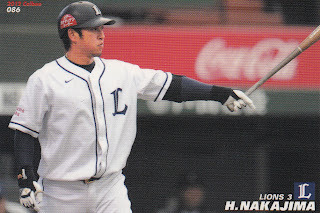 The Lions set is the same size as the Hawks set - 99 cards - but only 70 of them are "regular" player cards (including a card of manager Hisanobu Watanabe and two Ikusei players) plus two similarly formatted cards for the teams mascots. 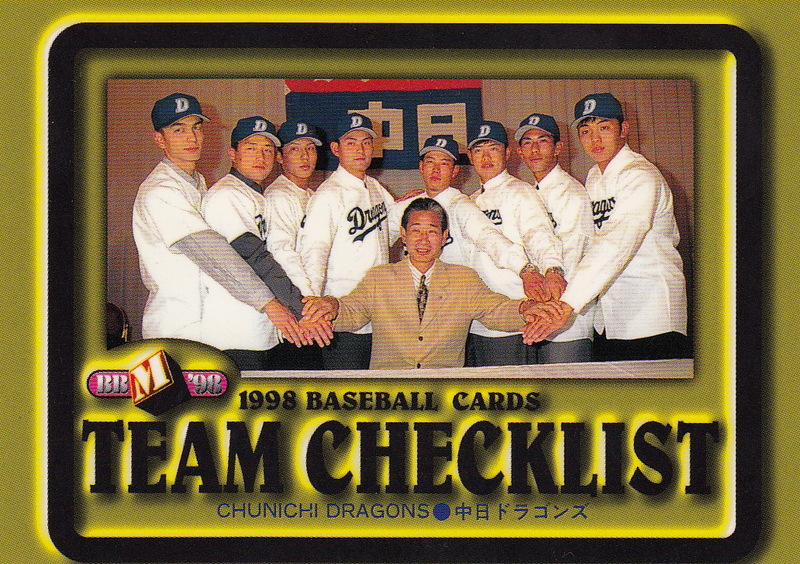 The remaining 29 cards are split in four subsets (plus a checklist card). The previous three subsets are pretty typical BBM subsets, but the final one is kind of unusual. 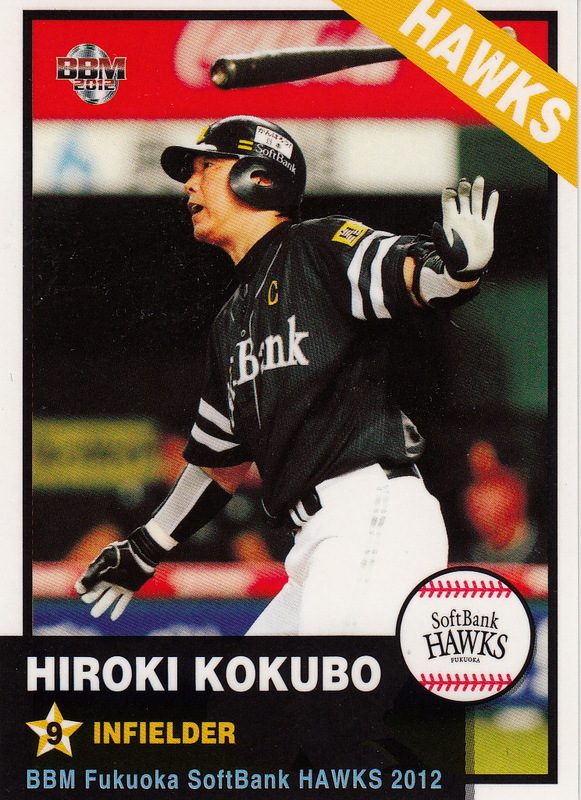 It's an eight card "Newcomer" subset but instead of swiping an old Topps design like they did for the Hawks, they've done something that I think is a little original. 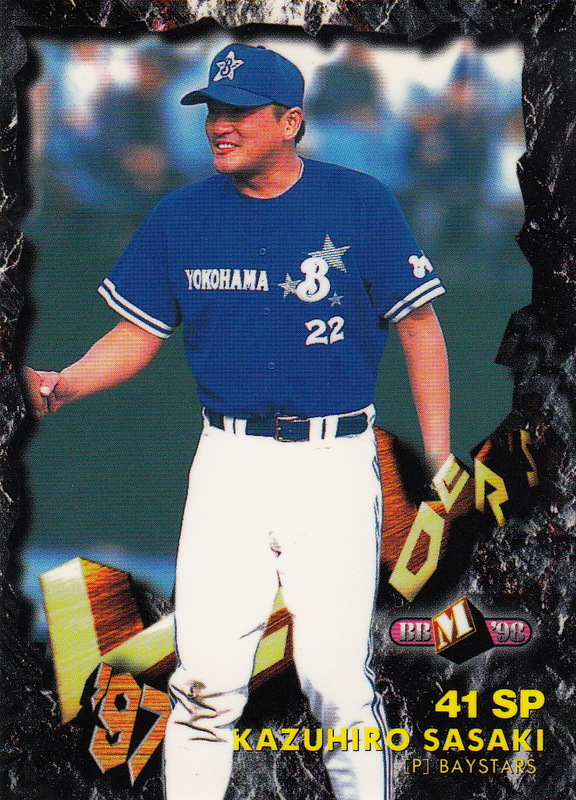 The cards are all portraits with "Newcomer" written across the top and the player's name, number and position written on the front. I think they're pretty attractive and I haven't seen a design like it before (although it would not surprise me if they based this design off of something that I either haven't seen or don't remember). All the Lions cards can be seen here. 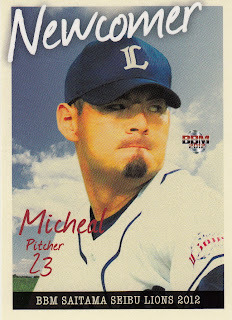 I need to thank Jason for his comments - I hadn't picked up on the 1953 Topps element in the Hawks set and I didn't know the Lions set was based on the 2009 O-Pee-Chee set until he mentioned these things. So last week I'm at the grocery store going through checkout when I notice the guy in the lane next to me. He's wearing a black and orange jersey top - not unusual for a Baltimore suburb. I can only see his back and I see the letters "hara" as the end of the name. So first I'm thinking it's a Koji Uehara Orioles jersey. But then I see the number is "5" - Uehara wore 19 with the Orioles so it's not him and Brooks Robinson's name doesn't end in "hara" so it's not an Orioles jersey. And then I see the whole name. Some guy in Abingdon, Maryland is wearing a Kazuhiro Kiyohara Yomiuri Giants jersey in the super market. Of course, I had to stop him and ask what the deal was (poor guy - he'll never wear that jersey in public again). He said a friend of his had sent it to him from Japan - he'd had to look up Kiyohara online to find out who he was. Not something you see around here everyday. 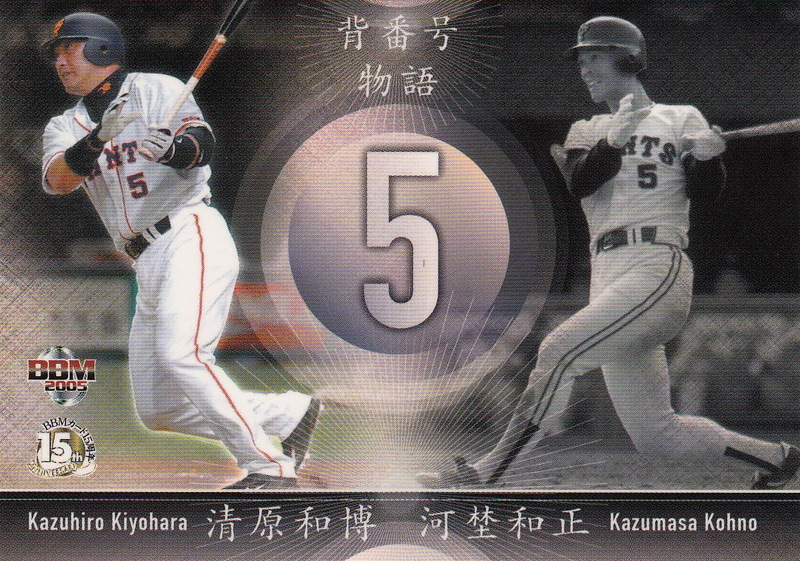 Here's a card of Kiyohara from the 2005 BB Giants set. They had a subset that I call "Shared Numbers" (no idea what the official name is). 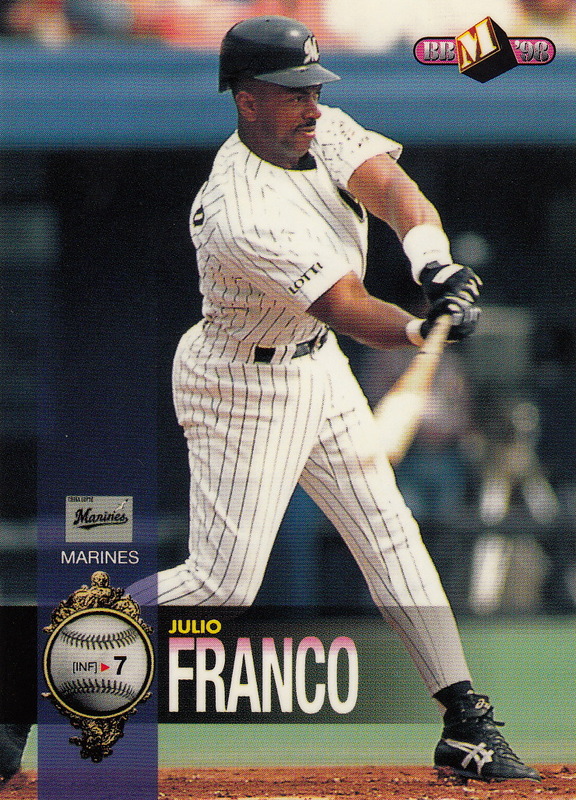 Each card in the subset showed an active player with a retired player who shared the same uniform number. Kiyohara's card (#G095) showed him with Kazumasa Kohno (the back of the card lists everyone who ever wore #5 for the Giants, going all the way back to 1935). This is kind of an odd set for me. For the longest time, I barely had any cards from the set at all - maybe 30 or so. 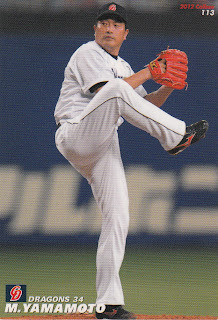 Then I scored a near set on Yahoo Japan Auctions via kuboTen and suddenly I had 500+ cards from it. 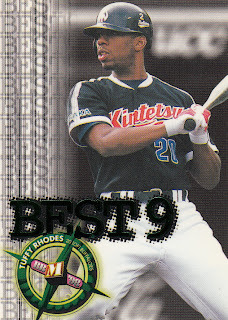 It remains the only set from the 90's that I never opened a pack for, so I have no wrapper or ad insert for this post. This set strikes me as a little short on the subsets with only three. 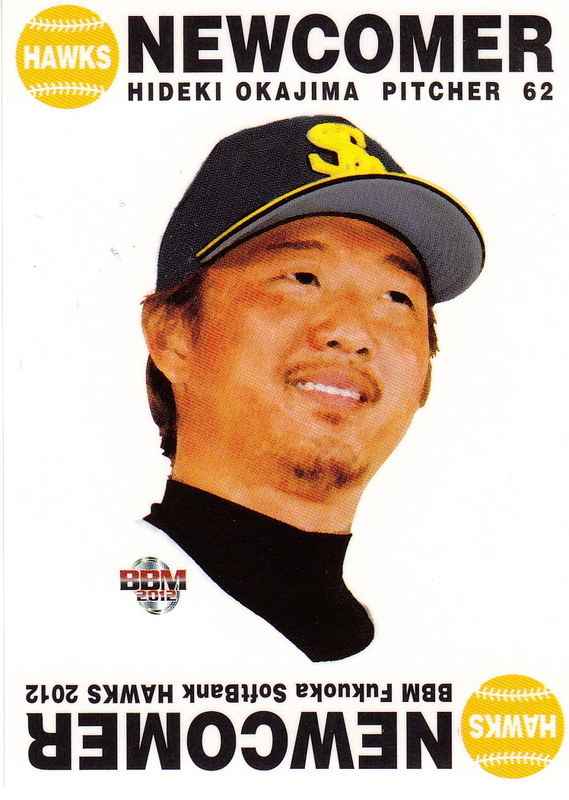 This was only the second year that BBM had included cards for the previous year's Best 9 teams and the first time that they were a subset in the regular set rather than an insert set. They would not be a subset in the regular set again until 2011. 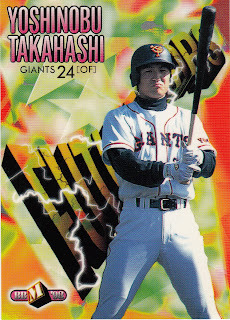 Similar to the 1997 "Hot Prospect" subset, the "Future Stars" subset featured a top prospect from each of the 12 teams. Unlike the 1997 version, most if not all the players appearing in this subset had regular cards in the set (and may have had cards in previous sets). The players in the set were Kenshin Kawakami, Yoshinobu Takahashi, Hajime Miki, Yukiya Yokoyama, Ryuji Yokoyama, Jin Nakatani, Tatsuya Ozeki, Tomoya Kawaguchi, Katsuhiro Maekawa, Satoshi Yano, Hiroshi Shibahara and Kazuya Fukuura. 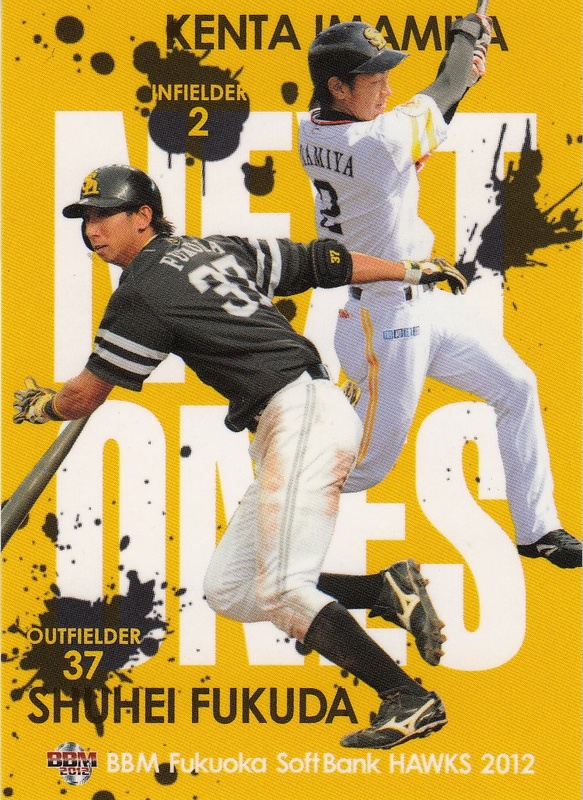 BBM celebrated the 40th Anniversary of the magazine Shukan Baseball with a nine card subset showing covers of the magazine from over the years. The earliest cover shown was from 1958 and the latest was from 1996. The nine cards were also available (somehow) as an uncut sheet. 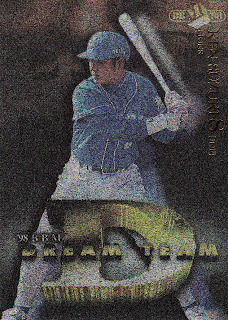 The Dream Team was a 10 card insert set which featured a "dream" lineup (including DH). There were two different versions of the cards. The "normal" cards had a gold/bronze tint to them. 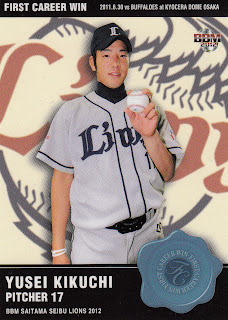 The rarer cards had a silver tint to them. The silver cards were not distributed in the packs but rather as a mail in contest. 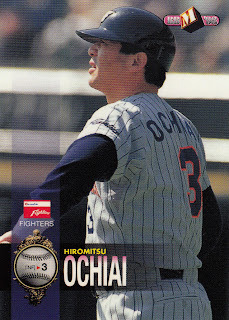 I don't have any cards from the other two insert sets, but luckily, since Ichiro was in both of them, Collecting Ichiro has them. 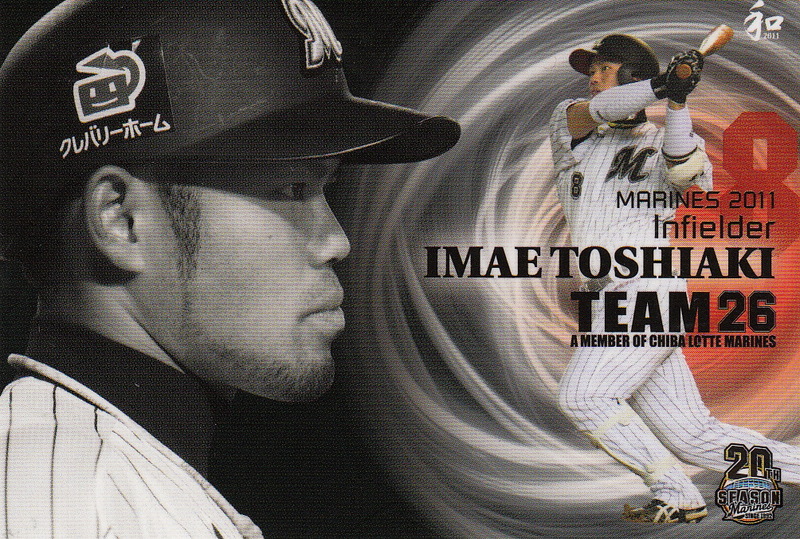 The Dream Matchups set contains six diecut cards that feature a pitcher and batter on each one. All twelve teams are represented on the cards. 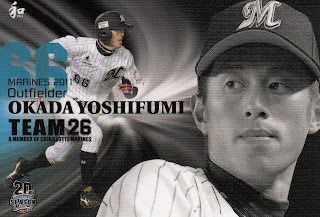 I'm not positive, but I think each card features a player from each league - this would have been seven years before interleague play started and the matchups at the time could have only happened in exhibition, All Star and Nippon Series games. 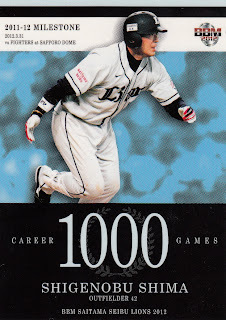 The Baseball's Best set contains only two cards - Hideki Matsui and Ichiro Suzuki. The cards featured raised seams on the baseball background. The set was the first of BBM's regular sets to feature memorabilia cards (although the first BBM set to feature them was the 1997 Diamond Heroes set). The set had two jersey cards for the 1997 league MVPs Atsuya Furuta and Fumiya Nishiguchi. 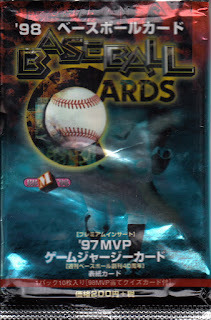 While none of the leader cards were short prints (despite what you might have read elsewhere), there exist larger sized versions of cards #1 and #2 (the two league MVPs). I don't know if these were some sort of box topper card or (like the silver version of the Dream Team cards) some sort of mail in offer. I try not to complain about what people are claiming about Japanese cards on eBay too much. So many people are making some many incorrect claims about cards that what's the point of complaining? 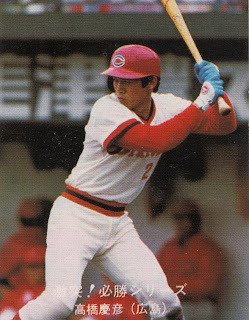 The people selling the stuff don't care that Hee Seop Choi and Fu-Te Ni are not Japanese, or that Yomiuri is not a suburb of Tokyo or that Masayuki Kakefu really isn't Sadaharu Oh. 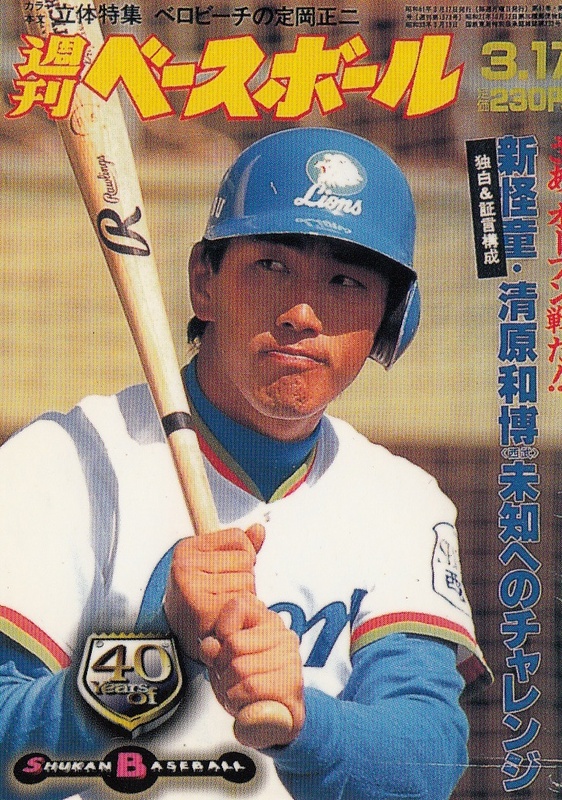 The prices people are looking for are occasionally hilarious also - I've seen asking prices of $399 for the 1991 BBM factory set and $30 for a 2005 BBM Seibu Lions pack (not box, single pack). I saw this auction today, though, and it just made me mad. Let's see now, this 1998 BBM Batting Leader card of Ichiro Suzuki is NOT his rookie card, is NOT a short print and is NOT worth anything near $72, let alone the "original price" of $90. Engel lists it as a $10 card which means it's probably worth about $5. So a couple days after I post this about a couple upcoming BBM sets, BBM finally gets around to putting information about three of the four sets I talked about up on their website. 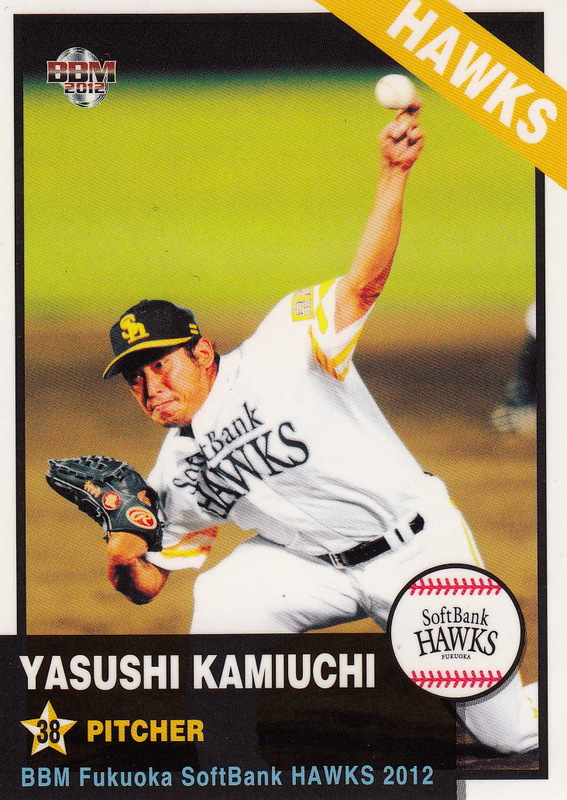 - The Celebration of The Hawks set is a 28 card box set featuring the Hawks in their colorful uniforms that they have worn in the summer in the last seven seasons (including the "VV Green" uniforms that they have been wearing lately). 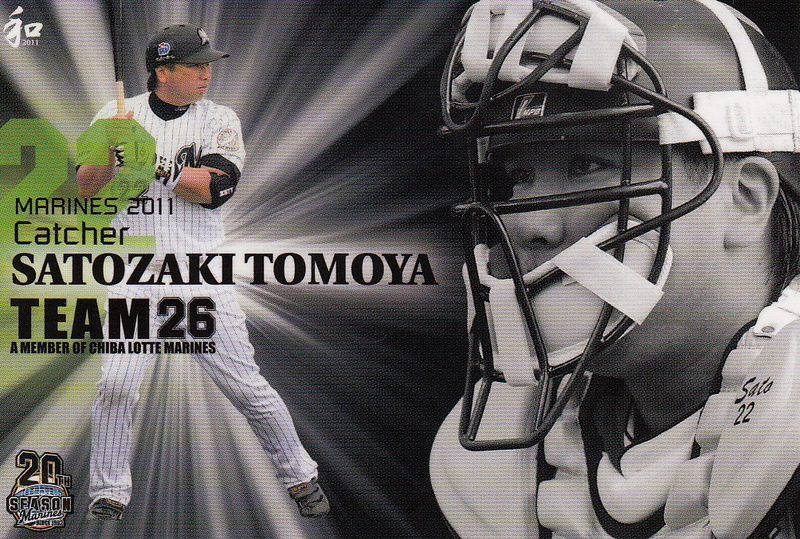 There will be 27 "regular" cards plus 1 "special card" (autograph, memorabilia or die-cut card). Since the cards feature pictures from the 2006 season until the current season, there are cards of players no longer with the Hawks (Toshiya Sugiuchi for example) and a card of Sadaharu Oh from when he was managing the team. The set will be out in late August. 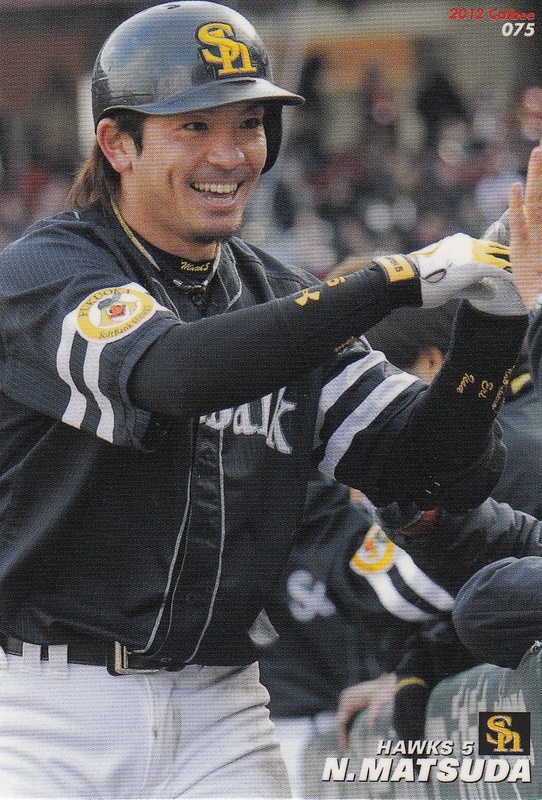 - The three players to reach 2000 hits this season (Atsunori Inaba, Shinya Miyamoto and Hiroki Kokubo) are being honored in the 2000 Hits Club box set. This set contains 29 cards - 27 "regular" cards (nine for each player) plus two "special" cards. 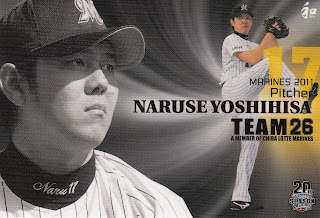 The "special" cards include possible jersey cards of the three players - some feature only one player, some feature all three. 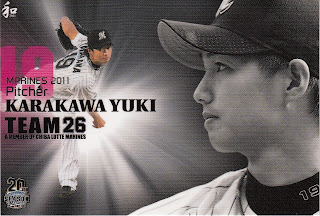 They also include possible autograph cards of the three players plus other 2000 Hits Club members that are associated with their teams (Fighters, Swallows and Hawks) - Atsuya Furata, Koki Akiyama, Tsutomu Wakamatsu and Yukio Tanaka. There are no other "special" cards listed on the webpage, but I don't know for sure if that means that each box will definitely contain jersey and/or autograph cards. The set will be out in late August. - BBM's first nostalgic set for the season (after the annual "Historic Edition" set that is) is the Nohitters set. 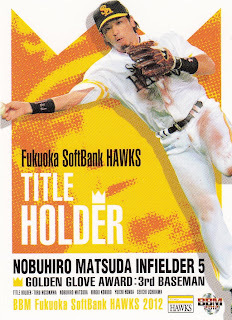 This is a pack based set that highlights nohitters thrown in Japanese professional baseball. 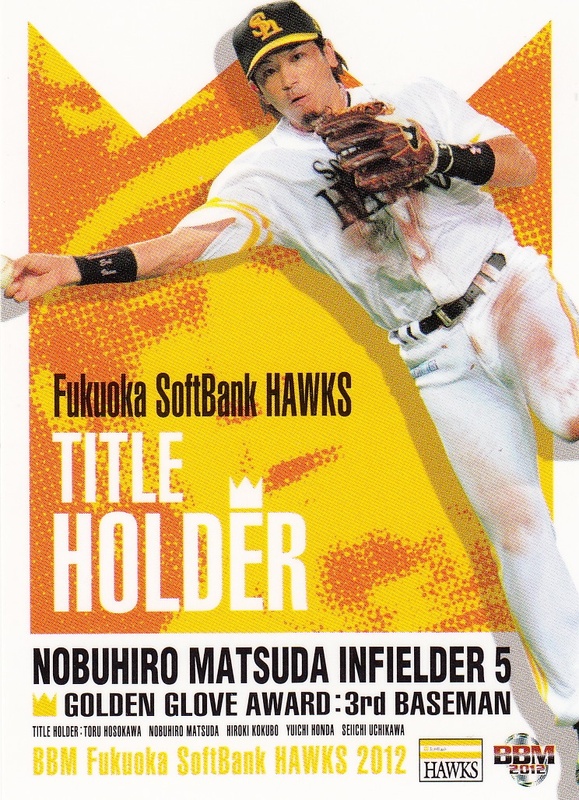 I don't know if every nohitter is covered, but the set does include Eiji Sawamura, who threw the first nohitter in Japan in 1936. 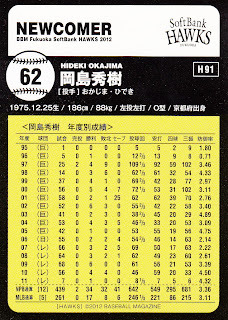 The set has 99 "regular" cards - 81 cards for pitchers who threw nohitters, 6 "combination" cards (this does not appear to highlight single nohitters thrown by a combination of pitchers like Daisuke Yamai and Hitoki Iwase's combination perfect game in the 2007 Nippon Series, but simply putting two pitchers on one card) and 12 "team nohitter" cards (I'm guessing that these will list all the nohitters for each of the 12 teams). 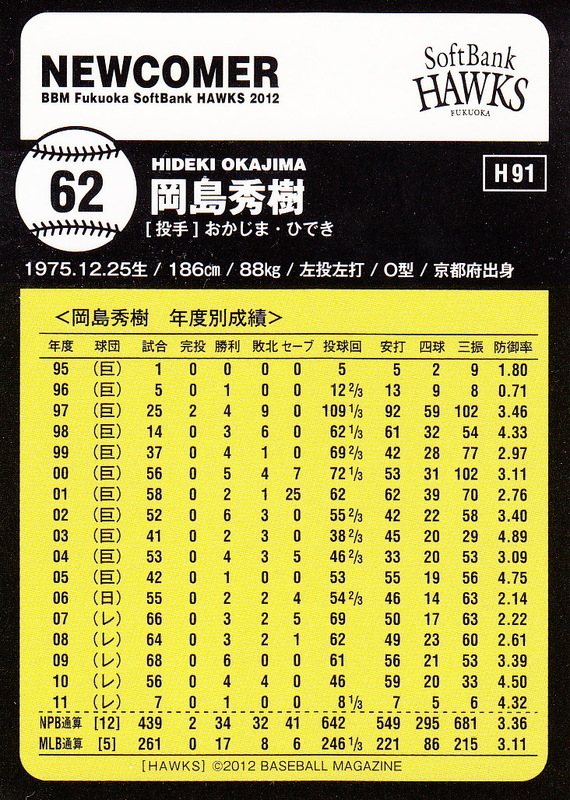 I will be curious to see if each of the 81 cards is for a particular nohitter or a pitcher who threw one or more nohitters. There is also a 9 card "Great Nohitters" insert set and possible autograph and memorabilia cards. The autographs are from pitchers who have thrown nohitters. 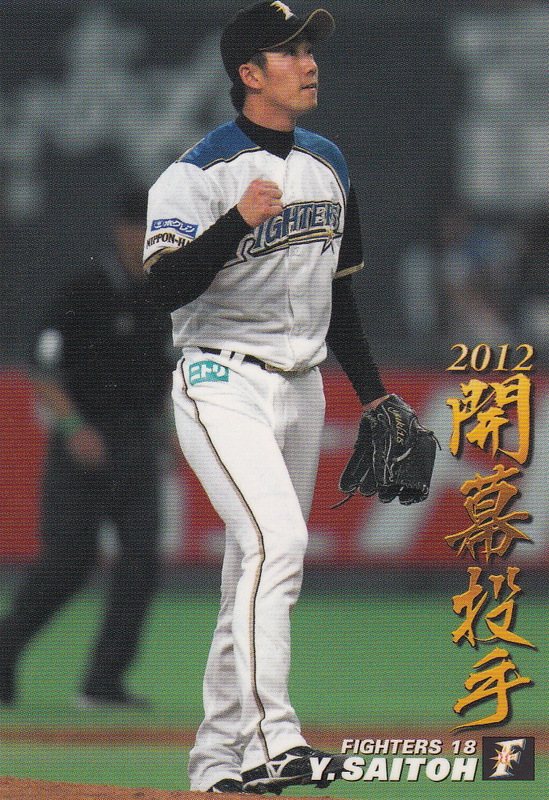 The memorabilia cards are for the two pitchers who threw nohitters this season - Kenta Maeda and Toshiya Sugiuchi. Like the two box sets, the set will be released in late August. 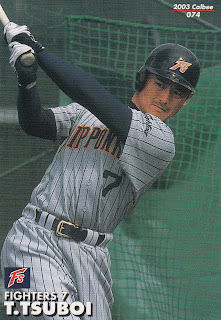 Deanna Rubin has a post up about attending a San Rafael Pacifics game and seeing one of her favorite players - former Tiger and Fighter outfielder Tomochika Tsuboi. 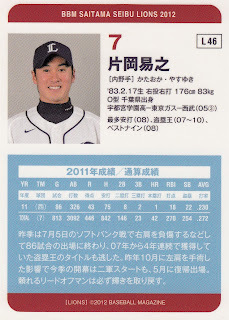 Tsuboi last played in NBP two years ago. 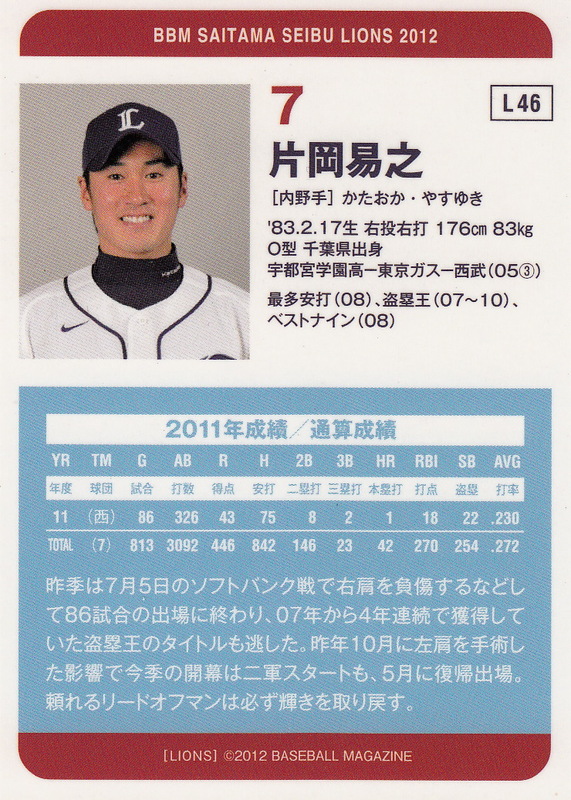 He signed with the Pacifics back in April (I'm not sure if or where he played last year). 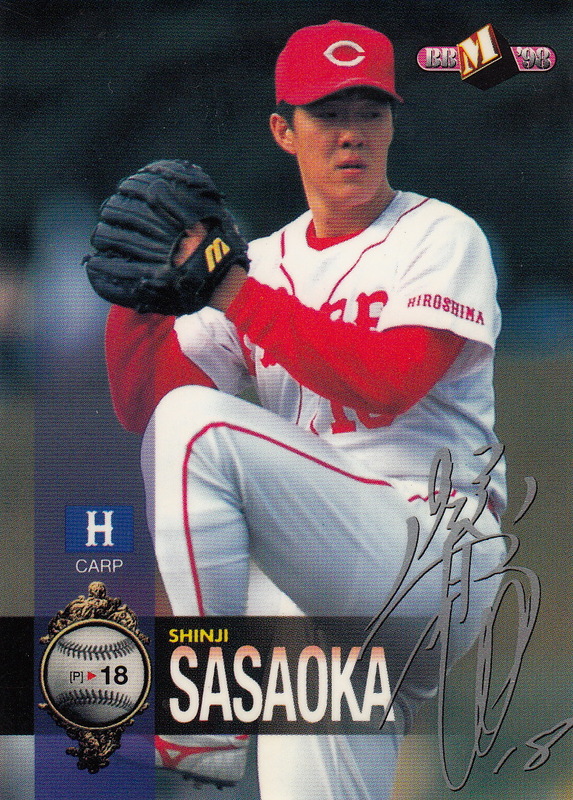 Jason's got another post up about team issued baseball card sets from Japan, either fan club issues or stadium giveaways (or both). He's researched an amazing number of cards from various places, an invaluable resource in light of Gary Engel's apparent decision to concentrate on the pre-BBM era for his latest checklist. The cards I'm showing here I picked up on eBay last year. I noticed something odd the other day. 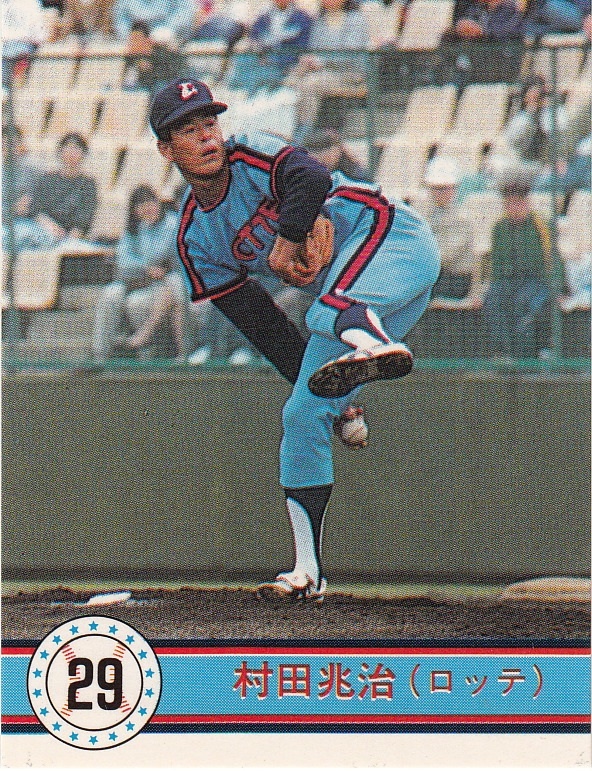 I recently won a lot of early 1980's Calbee cards on eBay. 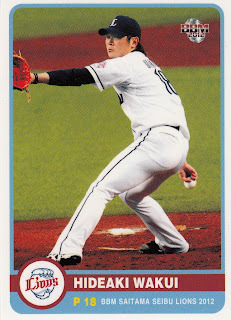 It occurred to me while I was sorting out the 80+ cards that I had gotten (mostly from 1983) that it was odd that I hadn't gotten any cards from the Lions or the Orions. 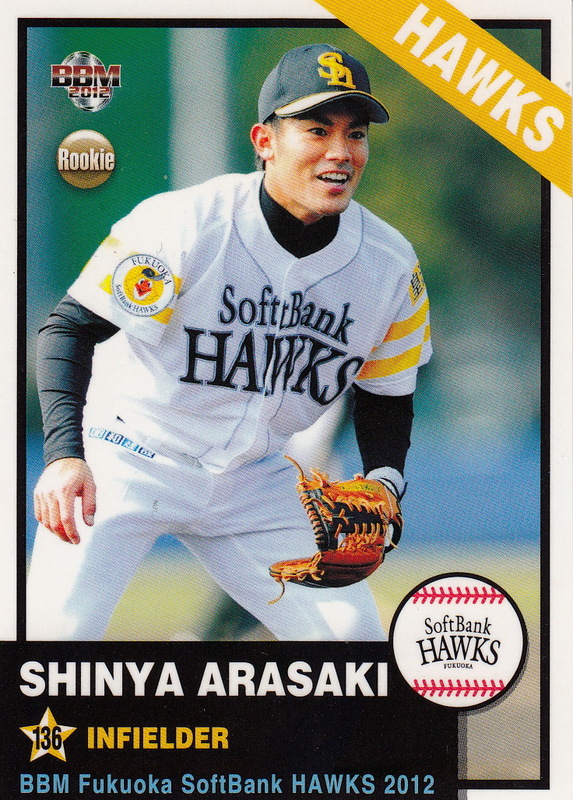 I have other Lions cards from Calbee sets from that time period, so I figured that it was just the way things worked out. 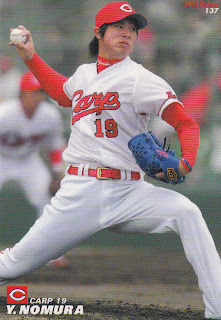 But I didn't have any Calbee cards of anyone from Lotte until 1986. 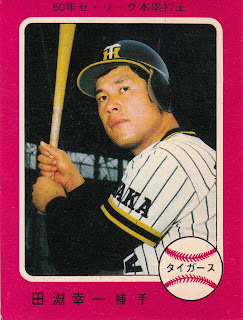 The chances of that happening just randomly seemed remote - I don't have a huge collection of Calbee cards from the 70's and early 80's but I have more than a few (including a big lot that I won last winter). How could it be that I had no Lotte Orion cards? 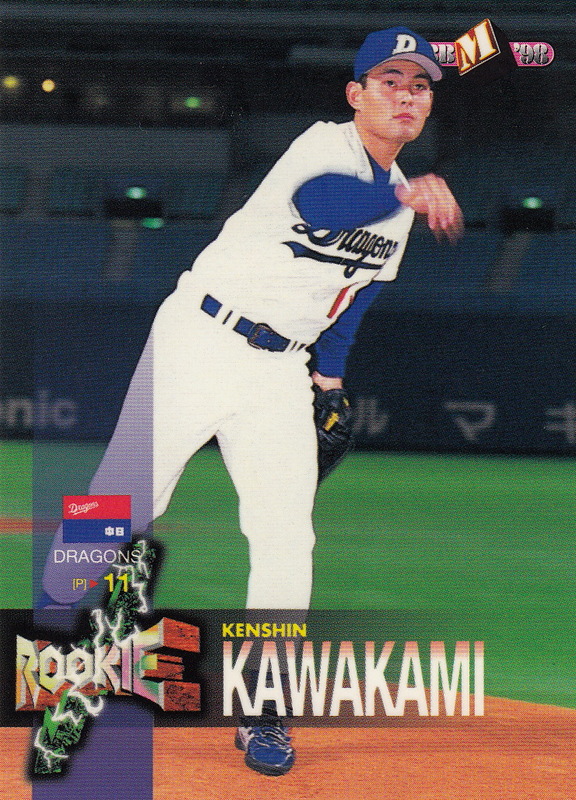 I spent a little bit of time on SportCardForum, checking out the database that Jason has so painstakingly added Japanese cards to. 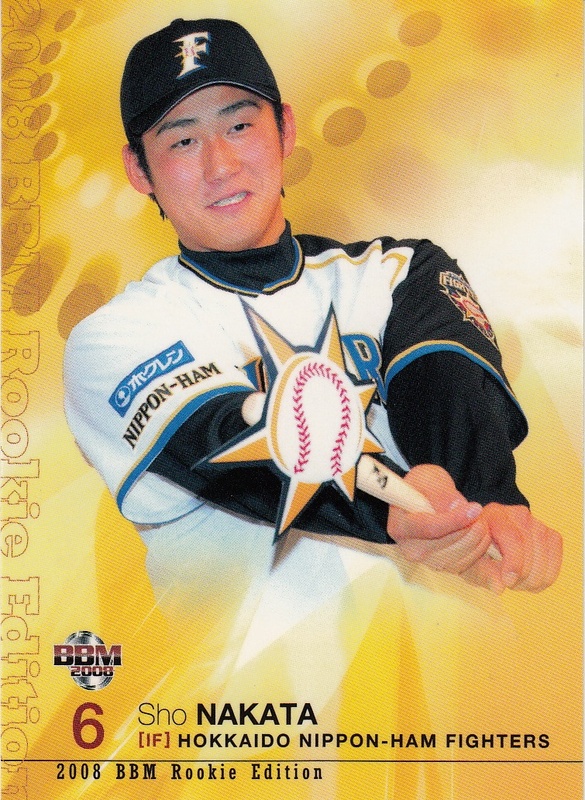 I looked up a couple guys who were pretty major players for Lotte during this time period. First, I checked out Michio Arito - some NST, some Takara, but not Calbee until 1985. Next up was Choji Murata. 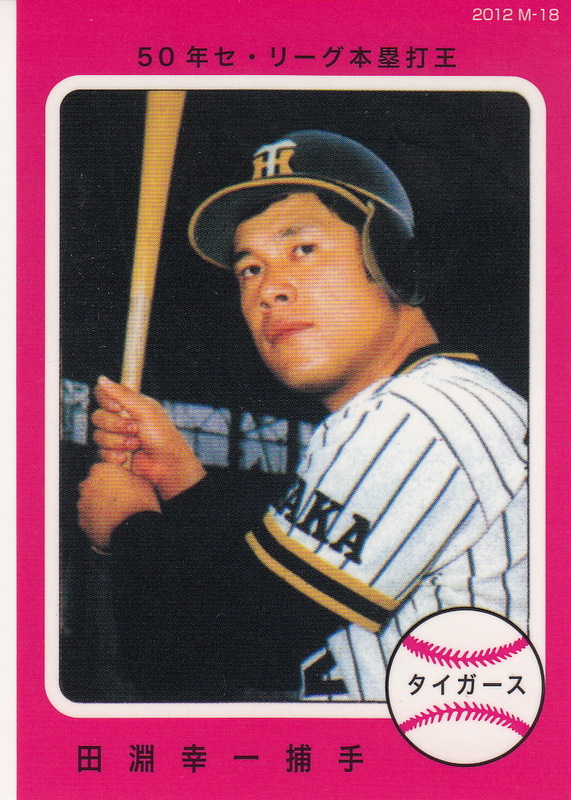 I found the same thing - no Calbee until 1985. 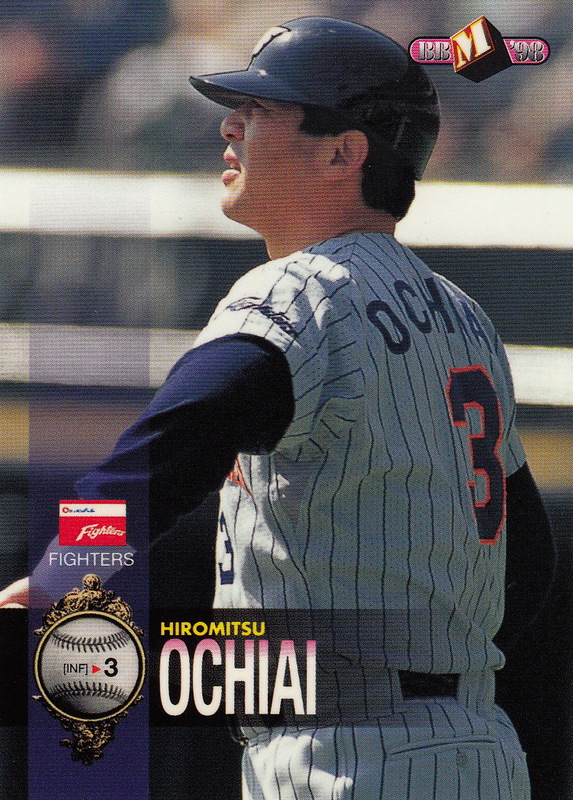 Hiromitsu Ochiai? No Calbee until 1985. Hmm, maybe Jason only added Calbee starting in 1985...nope. I do a search for Isao Harimoto and get Calbee cards starting in 1977 - but none in 1980 and 1981 when he played for Lotte. 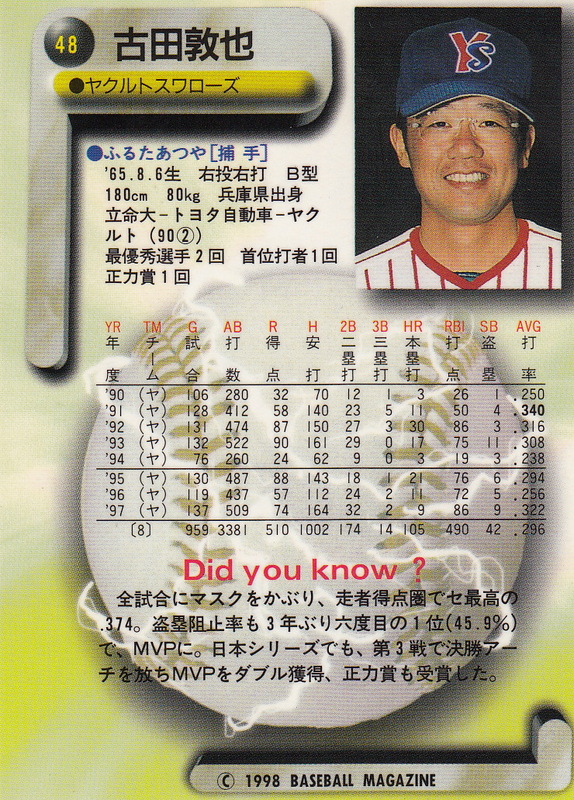 What about Katsuya Nomura, who spent 1978 with Lotte. 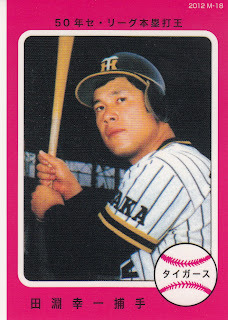 Nope, Calbee in 1977 when he was still with Nankai, Calbee in 1979 when he joined Seibu, but none from 1978. 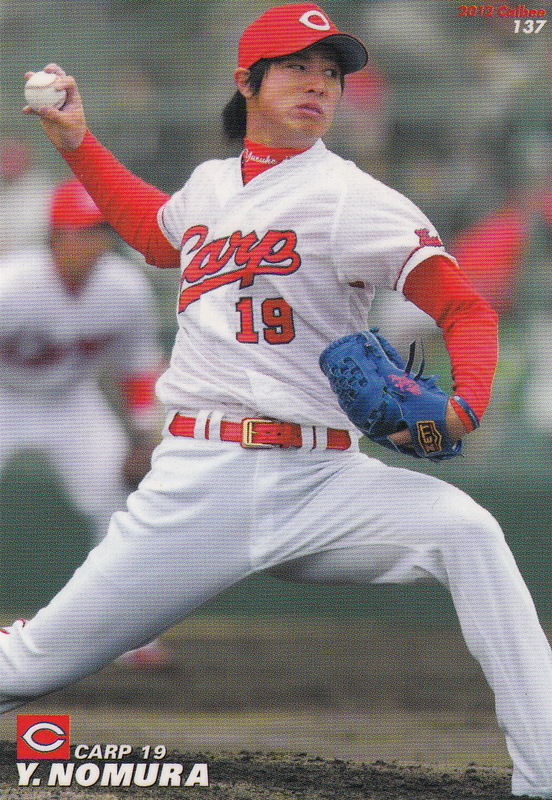 So it looks like Calbee did not do any cards for anyone from Lotte until 1985. Weird. 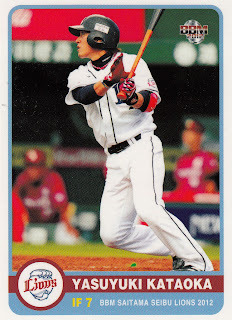 It seems like Calbee is the only card manufacturer to not have included the Orions. 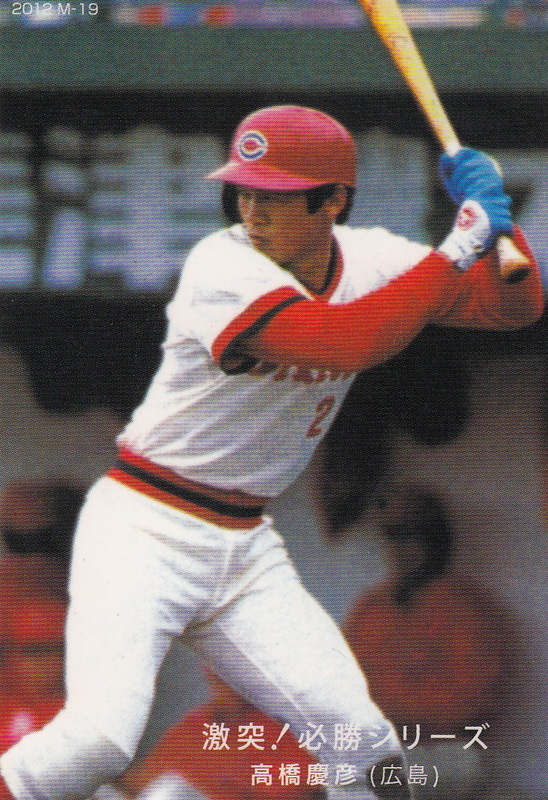 NST, Yamakatsu, Nippon Ham and Takara (once they started doing Pacific League teams in 1981) all included players from Lotte. Even the TCMA set from 1979 included a couple Lotte players. 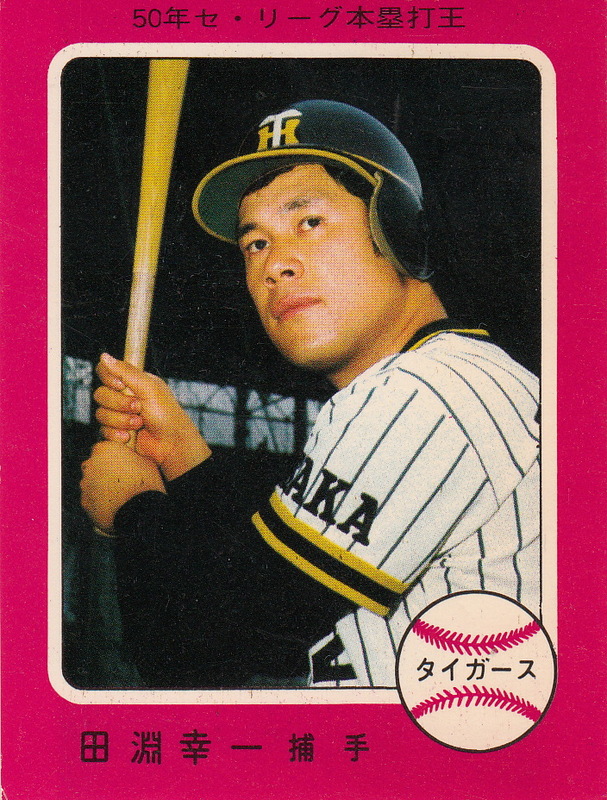 I have no idea why Calbee excluded the Orions for 12 years (1973 through 1984). This would be like Topps not doing any cards for the Phillies from 1952 to 1963. It could have something to do with Calbee and Lotte being competitors in the snack food market, but then why the change for 1985?